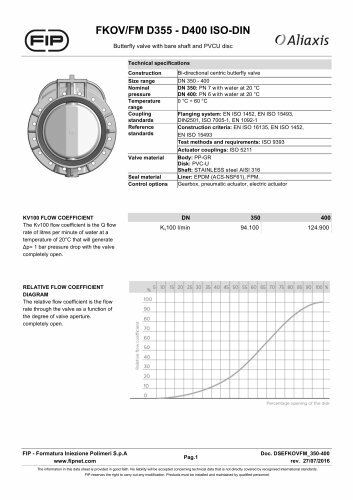 FKOV/FM D355 - D400 ISO-DIN Butterfly valve with bare shaft and PVCU disc OAliaxis Technical specifications KV100 FLOW COEFFICIENT The Kv100 flow coefficient is the Q flow rate of litres per minute of water at a temperature of 20°C that will generate Ap= 1 bar pressure drop with the valve completely open. Percentage opening of the disk RELATIVE FLOW COEFFICIENT DIAGRAM The relative flow coefficient is the flow rate through the valve as a function of the degree of valve aperture. completely open. The information in this data sheet is provided in good faith. No liability will be accepted concerning technical data that is not directly covered by recognised international standards. FIP reserves the right to carry out any modification. Products must be installed and maintained by qualified personnel.